Arcade Basketball Game - Rhino Play M01463W Double Shot Electronic Basketball Game. Free shipping to the lower 48 United States for this arcade basketball game. 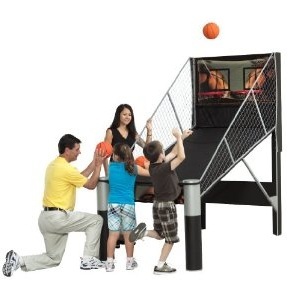 Meet the big brother of all the other home arcade basketball games. The M01463W features a steel cage, unlike netting on other lower-end systems, and a high-quality MDF backboard. The scoring board uses infrared sensors to keep track of score more accurately than the traditional plastic clickers. Play solo to beat your high score, or go head-to-head with a friend. This electronic arcade basketball system comes with 6 mini basketballs and a pump. Order your arcade basketball games here. Infrared sensors keep score for you more accurately than other basketball arcade games. Steel cage frame for great support and more competitive feel. Solo or head-to-head playing modes. Electronic timer for a more competitive game. Comes with 6 mini basketballs. Shipping weight: about 145 lbs. Shipping dimensions: 52 inches x 38.75 inches x 8.25 inches. Assembled weight: about 140 lbs. Assembled dimensions: 89 inches L x 47 inches W x 89 inches H.
Comes with a 90 day warranty from Escalade Sports. Ship via an LTL freight carrier for a curbside delivery. A curbside delivery means the customer must be present to sign for the order and help the driver unload the product. Ships from warehouse in Evansville, Indiana. Typically leaves the warehouse within 3 business days and specs 3-6 business days in transit time. Dimensions: 52" x 39" x 8"